Olive Tree Entertainment and Culture Think present to you a K-HIPHOP Concert for all our Australian/Oceania Hiphop fans. RAPBEAT SHOW is well recognised in the HipHop industry of Korea that has its own unique colour. We have invited 5 of the most popular and loved Korean HipHop artists who will create a night you won't want to miss! There are NO seatings for SILVER. Tickets can be purchased through one payment or through several instalments. Once you have purchased your online ticket, please print out the E-TICKET and bring it in on the Concert. This concert is for all ages. Ticket purchase is limited to 10 per transaction. However, you can perform more than one transaction. Information regarding offline ticket vendor and dates will be made available later. Please print out E-TICKETS for online purchases to present upon entry. Offline tickets are non-refundable therefore please treat it like cash. All tickets are non-refundable and non-exchangeable, please check event details prior to purchase. Tickets unofficially purchased through other routes will not be refunded or cancelled. The host/ promoter/ Ticketbooth will not hold responsibility for damage or mishap of the ticket. Entry into venue will be on a first come first serve basis. Please note, opening time may vary according to rehearsal schedules. For those arriving early, please line up accordingly at the entrance. The day of the concert may be very busy, please allow plenty of time to come to the venue. Once arrived, please locate the entrance and line up accordingly. Please remain hold of your tickets throughout the event as there may be random ticket checks. Bottles, cans, alcoholic liquors, firearms, Hazardous materials (knife, sharp items) is prohibited in the venue. Please take care of personal belongings in case of damage. The host/promoter/Ticketbooth will not be held responsible for any damages or loss of personal belongings. For safety purposes, personal belongings brought into the venue will be checked upon entry. Smoking is prohibited within the Showground. 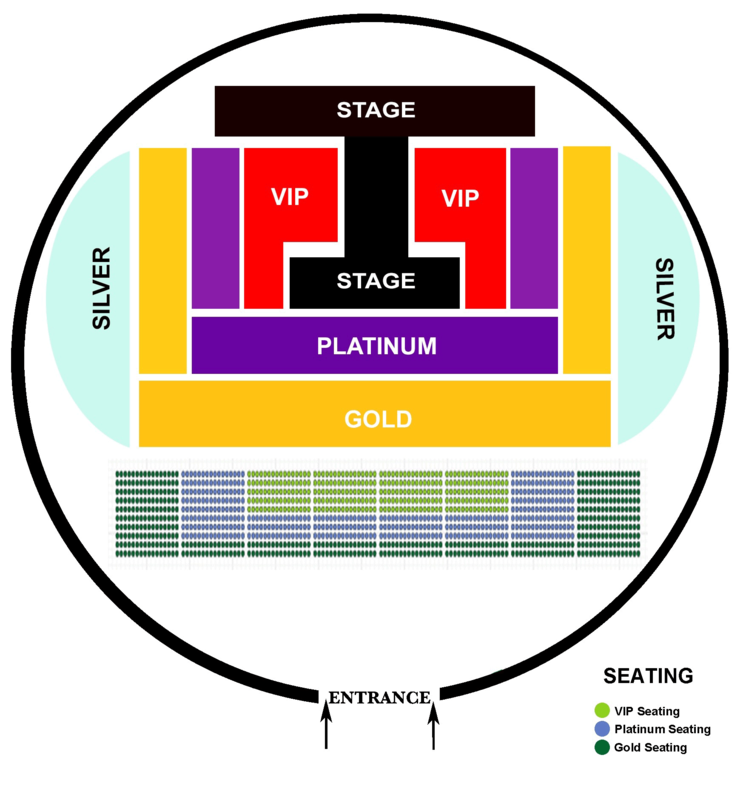 The stage is set up as a T-shaped stage for the artists to perform freely.Please refer to the image below for seating plans. Casual parking is available for $5 per hour or $25 per day (maximum). Please refer to map below for public transport. In cases of delays, please arrive at the venue beforehand. © 2019 Ticketbooth on behalf of Olive Tree Entertainment. All sales are final. Tickets are non-refundable.